If you’re anything like me, just hearing the words “bass fishing” evokes childhood memories of sweltering hot summers and brightly colored deer hair poppers. Like most “nubie”fly anglers, I cut my teeth catching largemouth bass. Unlike other freshwater species who’s diet consists of a minuscule bugs and worms, a largemouth can and will eat just about anything that hits the water. Although small baitfish, frogs and lizards immediately come to mind, they will also consume small, mammals, birds and even baby alligators…here in FL! That being said, I did my best to select an assortment of proven patterns for this book that provided a wide array of menu options as well as teach you some fun and new tying techniques for creating your own unique creatures! 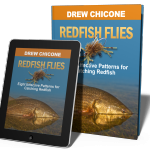 The classic and contemporary largemouth bass patterns included in this book have a track record of success in a number of different conditions and fishing scenarios. Largemouth Bass Flies contains detailed step-by-step instructions for tying Leiser’s Bass Angus, Mahler’s StrawBoss, CJ’s Freaky Frog, Chicone’s King Rat, Pineapple Grenade Popper, Sunny Corleone Sunfish, and Carnivore Crayfish. 7 proven patterns for catching Largemouth Bass. This is a 199-page eBook, illustrated with ultra-hi resolution images.